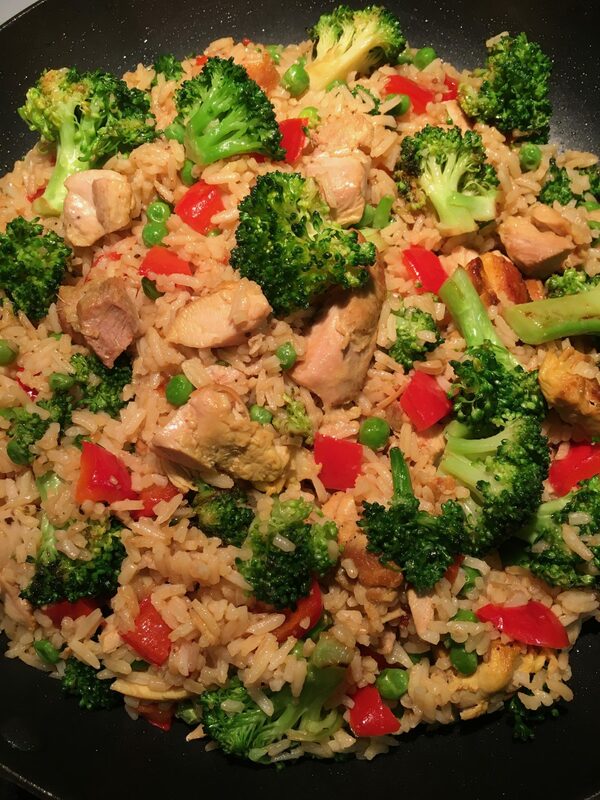 In honor of Chinese New Year this week, here is my favorite chicken fried rice. To be honest, I don’t know anyone who doesn’t love Chinese food. Besides, we can’t deny how much the Chinese has influenced our food culture. So can we just have a moment of silence to celebrate it? Yes, because I’m grateful for every Chinese food I ever ate in my life. When I was growing up in a big family of 6 kids, it was certainly popular. So familiar and craveable! What I love about this fried rice is it’s a whole meal in one plate. Who wouldn’t want less dishes to wash, right? The other thing I love is it has tons of healthful vegetables in it. No MSG here too. Above all, it cooks really fast. So delicious and comforting! So if you are looking for a fast, fresh and healthy weeknight dinner, this is for you. And if you got leftover rice sitting in your fridge, here’s a great way to use it. Heat 1 Tbsp of canola oil in a large nonstick skillet on medium-high heat. Season chicken with a little salt and pepper. Stir fry the chicken in the hot oil for about 5 minutes, until it is cooked. Transfer chicken on a plate and set aside. Meanwhile, heat another 1 Tbsp of canola oil in the same skillet on medium heat. Add the broccoli and stir fry for 3-4 minutes. Transfer broccoli on a plate and set aside. Heat 1 Tbsp of canola oil on the same skillet on medium heat. Add ginger and garlic and let cook for 10 seconds. Then stir in bell pepper and cook for another 2 minutes. Add the rice into the skillet while pressing to separate the grains, and cook for 2 minutes. Stir it again and cook for another 2 minutes. Then mix in peas, soy sauce, Mirin, sesame oil, rice vinegar and freshly ground pepper. Let it cook for another 3 minutes, turning once. 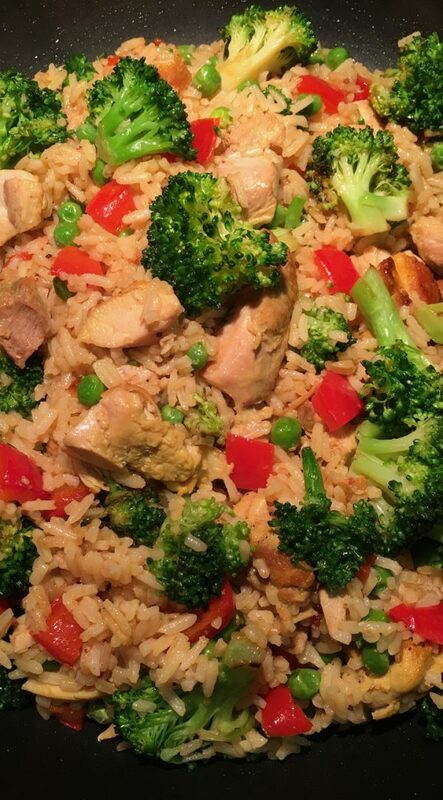 Stir in cooked chicken and broccoli. Turn off heat. Serve immediately with a garnish of chopped green onions on top.